Austin home builders in the area and the builder of choice by residents in The Reserve at Lake Travis, a community developed by Hal Jones Development. 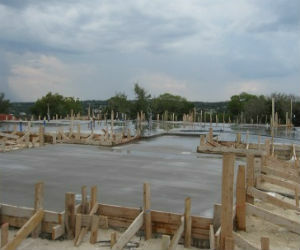 Recently, Sterling poured the foundation for its second custom home within the community. Austin luxury real estate is located on Ruffian Heights Cove and is the epitome of luxurious homes in the community. When completed, the home will sit on a cliff and have a breathtaking view of Lake Travis. The Reserve at Lake Travis is nestled along 3 miles of shoreline on Lake Travis’ southern banks and is composed of 310 acres of rolling Texas hills. Waterfront homes in the community are priced from the $199s, while maintenance-free villas are priced from the $500s. Homeowners enjoy the luxe amenities that the community offers. Residents have access to a world-class marina, lazy river pool with swim up bar, full-service equestrian center and a private Cypress Club Pavilion for its members. As one of the area’s top builders, Sterling Custom Homes understands the importance of each design element. From everything down to site selection at The Reserve at Lake Travis, Sterling takes pride in offering advice and design solutions that suit any preference. Sterling Custom Homes online or call 512-263-2214.